Home/Concrete Repair/Flexomeric Resins / FLEX-1150 Wall Crack Repair Resin - Ultra Low Viscosity Polyurethane - Crack Width: Hairline to 1/16"
FLEX-1150 is designed to repair concrete cracks that are from hairline to 1/16" wide. FLEX-1150 Wall Crack Repair Resin - Ultra Low Viscosity Polyurethane - Crack Width: Hairline to 1/16"
Flexomeric FLEX-1150 is a dual component, low viscosity, high-quality crack repair resin. 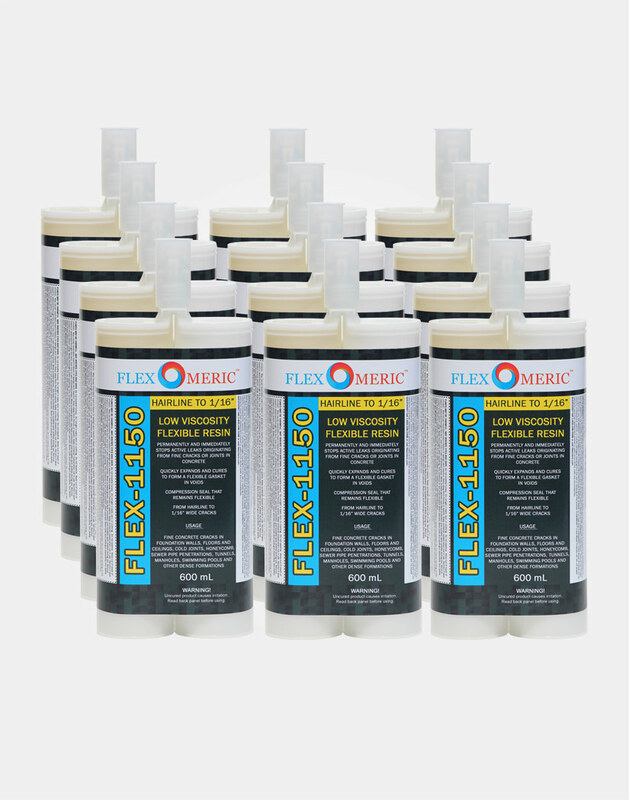 Flexomeric FLEX-1150 is designed for sealing dry and active water leaks in various cracks or joints in below-grade foundations and concrete structures. For hairline concrete wall cracks (less than 1/16" wide). 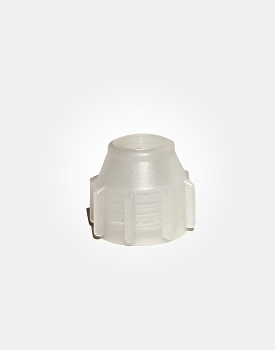 Includes one nozzle and one retaining nut (required for utilization). These are not included with contractor pricing. Q: Hi, i live at Saint-Eustache. Can i buy directly from your store? Thank's. 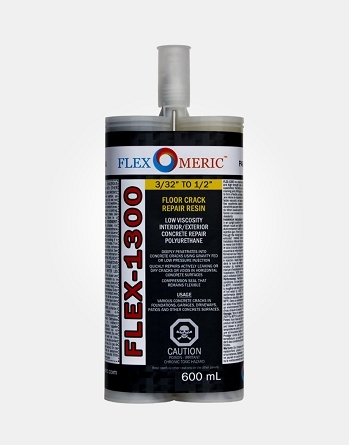 FLEX-1200 is a dual component, ultra-low viscosity, fast setting, and high strength crack repair resin. Its excellent bonding capabilities, flexibility and durability can withstand concrete cracking and shifting as the result of thermal cycles. 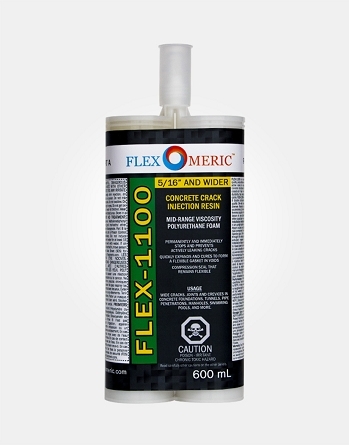 FLEX-1100 is a dual component, mid-range viscosity, high quality polyurethane injection resin. 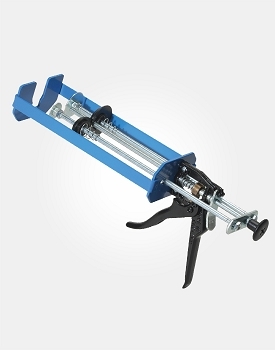 It is designed for sealing active leaks in various cracks or joints in below grade concrete structures. 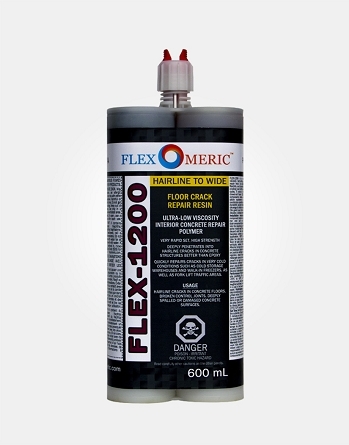 FLEX-1300 Floor Crack Repair Resin - Low Viscosity Polyurethane - Crack Width: 3/32" to 1/2"
FLEX-1300 is a dual component, low viscosity, fast setting, and high quality crack repair resin. Its excellent bonding capabilities, flexibility and durability can withstand concrete cracking and shifting as the result of thermal cycles. 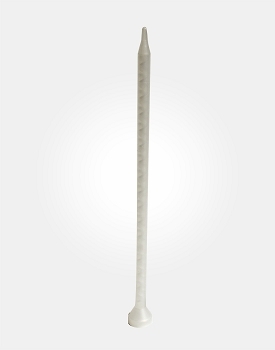 FLEXMIXER-500 is a crack injection nozzle static mixer, 1/4" x 24", used for dual cartridges. 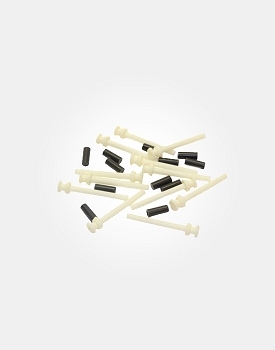 FLEXNUT-550 is used for attaching static mixers to dual cartridge tubes. Trusted by waterproofing contractors worldwide. Copyright Flexomeric Crack Repair Products, Ltd. All Rights Reserved. ®™ Trademarks of AM Royalties Limited Partnership used under license by LoyaltyOne, Co. and Flexomeric Crack Repair Products Ltd.